CHANEY, John Crawford, a Representative from Indiana; born near New Lisbon, Columbiana County, Ohio, February 1, 1853; in 1854 moved to Lafayette Township, Allen County, Ind., with his parents, who settled on a farm near Fort Wayne; attended the common schools; was graduated from Ascension Seminary, Farmersburg, Sullivan County, Ind., in 1874 and later from the Terre Haute Commercial College; taught school and served as superintendent of schools for five years; was graduated from the law school of Cincinnati University in June 1882; was admitted to the bar in 1883 and commenced practice in Sullivan, Sullivan County, Ind. 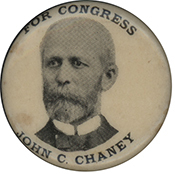 ; member of the State central committee from the second district in 1884 and 1885; appointed by President Harrison as assistant to the Attorney General in the Department of Justice in July 1889, which position he filled until August 1893, when he resigned and resumed the practice of law; elected as a Republican to the Fifty-ninth and Sixtieth Congresses (March 4, 1905-March 3, 1909); unsuccessful candidate for reelection in 1908 to the Sixty-first Congress; continued the practice of law in Sullivan, Ind. ; died in Sullivan, Ind., April 26, 1940; interment in Center Ridge Cemetery.